Evidence Category D: Consensus judgment by SCIPV members. This category was only used in cases where the provision of some guidance was deemed valuable, but the clinical literature addressing the subject was insufficient to justify placement in one of the other categories. Each section was prepared by a member of the panel and then internally reviewed by other members. The panel conducted round-table discussions frequently and jointly. International experts helped in reviewing the guidelines. S. pneumoniae (pneumococcus) is global in distribution and affects all age groups., Those at highest risk of severe pneumococcal disease are very young children, the elderly (>65 years old), and those with risk predisposing factors, which are summarized in [Table 1].,, All risk factors that included in [Table 1] are applicable to Saudi Arabia population. Pneumococcal serotypes causing community-acquired pneumonia (CAP) and IPD differ between various geographical areas, and the distribution seems to be dependent on the period the studies were conducted and the use of pneumococcal vaccines in the geographical locations., To the panel knowledge, no large-scale controlled studies have been conducted in Saudi Arabia on the relative importance of pneumococcal infections and the true burden of pneumococcal infections is unknown. Several reports indicate that pneumococcal infections are common and impose an important burden on Saudi Arabia health services. A retrospective analysis conducted in two regions between 1999 and 2003 before the introduction of PCV found that the average annual incidence of IPD in children aged ≤5 years was 17.4/100,000 population. The incidence during the 1st year of life was almost 4 times more than the average incidence in the following 4 years. IPD presented as meningitis and bacteremia in 23.2% and 76.7% of cases, respectively. Another study from three hospitals in Mecca city reported that S. pneumoniae was the main isolate from age groups <10 and >40 with an incidence rate of 36.8% and 57.9, respectively. In a report from a university hospital in Riyadh conducted between 2000 and 2004, 62% of pneumococcal isolates from all age groups and 83% of isolates from children aged <2 years were included in the PCV7. In a recent large prospective population-based study of CAP in hospitalized adults in the USA, a pathogen was identified in 38% of patients and S. pneumoniae was the responsible pathogen in 5% of them. Pneumococci are becoming increasingly resistant to commonly used antibiotics worldwide, and management of pneumococcal diseases is becoming more difficult with the spread of multidrug resistant (MDR) strains.,,, Since the identification of MDR S. pneumoniae (resistant to >3 different antimicrobial classes) in the 1970s, its prevalence has steadily increased in many countries.,, In 1988, a report from Saudi Arabia showed that all S. pneumoniae isolates were sensitive to penicillin and vancomycin, but 65% were resistant to trimethoprim-sulfamethoxazole. A newer study reporting childhood pneumococcal bacteremia in Riyadh showed that 20.4% of the isolates were penicillin-resistant and 22% were MDR. Worryingly, recent reports show that more than half of pneumococcal isolates are now resistant to penicillin.,,,,, Many penicillin-resistant pneumococci in these studies were found to be resistant to other antimicrobial drugs, for example, macrolides, trimethoprim-sulfamethoxazole, and extended-spectrum cephalosporins. Other studies between 2005 and 2010 have reported IPD in children aged <5 years with 66% and 62% resistance to penicillin and erythromycin strains, respectively. Based on international experience, the introduction of pneumococcal vaccines has been shown to reduce the rate of the disease, especially those caused by drug-resistant strains due to the protective action of the vaccine against serotypes responsible for drug resistance. S. pneumoniae (pneumococcus) is a gram-positive lancet-shaped diplococci., The pneumococcal cell wall surface is covered by a polysaccharide capsule which consists of teichoic acid and peptidoglycan. The capsule is an essential virulence factor and means of evading the immune system by resisting phagocyte killing. On the basis of differences in the composition of this capsule, over >90 distinct pneumococcal serotypes have been identified. In general, immunity following infection is serotype-specific, but cross-protection between related serotypes could occur. Antibodies directed to the capsule polysaccharide are highly protective and they play a central role in protection. They also form the basis for immunogenic and protective immune responses generated by current vaccines. Available pneumococcal vaccines contain capsular polysaccharides from common serotypes that are associated with severe invasive disease. It has been noted that the distribution of serotypes that cause pneumococcal diseases varies based on many factors that include age, disease type and severity, and geographic region. The clinical manifestations of S. pneumoniae infection are wide ranging from asymptomatic carriage to rapidly fulminant disease. Direct extension from the nasopharynx through local invasion or inhalation of contaminated infected droplets can cause conjunctivitis, sinusitis, otitis media, pharyngitis, tonsillitis and pneumonia, and acute exacerbations of chronic obstructive pulmonary disease (COPD).,, Direct invasion can cause bacteremia and IPD occurs through hematogenous spread to all organs and tissues of the body. Common clinical presentations of IPD include septicemia, bacterial meningitis, lobar pneumonia, endocarditis, osteomyelitis, septic arthritis, peritonitis, cellulitis, myositis, periorbital cellulitis, and abscesses.,, IPD affects mainly extremes of ages: <12 months and ≥65 years. Other groups who are more likely to develop IPD are shown in [Table 1]. In a systemic review of literature from the Arabian Peninsula and Egypt that covered the period between 1990 and 2007, the incidence range of IPD in children aged ≥5 years was 3.4–53.5/100,000 population. IPD presented as bacteremia in 61–100% and meningitis in 3–25% for children aged <2 years. The case fatality and morbidity rates for pneumococcal meningitis were 0–22% and 10–62%, respectively. Transmission of pneumococci from person-to-person occurs by direct contact with respiratory secretions, such as saliva and mucus, or by droplets coughed up by an infected patient. Many people, especially children, have the pneumococci in their nostrils, pharynx, or throats without manifesting symptoms or signs of ill health. This is called asymptomatic carriage where S. pneumoniae colonize the upper respiratory tract in 5–10% of healthy adult and 20–40% of healthy children. Carriage usually requires frequent or prolonged close contact and crowdedness and is associated with young age, female gender, winter season, and exposure to antibiotics during the previous month., Susceptibility to infection occurs more in situ ations such as malnutrition, fatigue, or intercurrent viral infection and seasonal variation with a tendency toward peaking in the winter. After colonization in the nasopharyngeal, infection of nearby sites may develop. Alternatively, infection might also be caused by direct aspiration into the bronchial tree causing pneumonia or by hematogenous invasion leading to bacteremia, meningitis, or infection of other distant organs. The development and introduction of pneumococcal vaccines represented a major advance for prevention of pneumococcal infections. The widespread use of vaccines in recent years has led to reductions in the incidence of pneumococcal disease in high-risk population. At population level, the decline is occurring for both those who are vaccinated and also among older, nonvaccinated children, and adults since the vaccine effectively eradicates nasal colonization as well. This phenomenon is called the “herd effect” that can result in a significant decline in pneumococcal disease due to serotypes contained in the vaccine in individuals who do not receive the vaccine. Currently, there are two different types of pneumococcal vaccines recommended for use: (1) PPSV23 and (2) pneumococcal protein-conjugate vaccine. Both vaccines are inactivated vaccines and do not contain any live organisms. The efficacy of the vaccines is limited to the specific pneumococcal strains from which the capsular serotypes were used to make the vaccine and thus does not extended to other serotypes. The adult vaccine (PPSV23) protects against 23 strains, and in Saudi Arabia the childhood vaccine (PCV13) protects against 13 strains with overall protection around 50–70%. Due to the high burden of IPD caused by serotypes included in the two available vaccines, wider protection may be provided using both vaccines in certain situations. Both pneumococcal vaccines are available in Saudi Arabia. PPSV23 is available as a single dose of 0.5 mL. It should be inspected before administration to ensure that it is colorless and clear. It is routinely given by intramuscular route at any time of the year; however, subcutaneous route is an acceptable alternative to persons with bleeding tendency. Intradermal route can cause local reactions and is not recommended. Pneumococcal protein-conjugate polysaccharide vaccines are covalently conjugated to a nontoxic carrier protein which evokes a T-cell-dependent antibody response, mucosal immunity, and immunologic memory in both children and adults. Conjugation of the polysaccharide to a protein renders the vaccine immunogenic in infants and toddlers., In January 2009, the pneumococcal protein-conjugate vaccine PCV7 containing capsular polysaccharides from 7 serotypes was nationally introduced to the neonatal vaccination program by the Saudi Ministry of Health based on the global experience in reduction of resistant organisms and IPD. PCV7 was then replaced by PCV13 in 2011. PCV13 is covalently linked to a nontoxic protein which renders the polysaccharide antigenic in infants and toddlers., It was approved in 2011 for the use in adult ≥50 years. PCV13 contains polysaccharide from 13 common capsular types (1, 3, 4, 5, 6A, 6B, 7F, 9V, 14, 18C, 19A, 19F, and 23F). The 13 serotypes account for about 91% of the pneumococcal isolates that cause serious infection in Saudi Arabia. However, two recent reports from Saudi Arabia have shown the serotype coverage of PCV13 to be 81% and 87%., In the Community-Acquired Pneumonia Immunization Trial in Adults, PCV13 was effective in preventing vaccine-type pneumococcal among adults, bacteremic and nonbacteremic CAP, and vaccine-type IPD. Taking into account our literature review and deliberations of SCIPV committee, the STS SCIPV pneumococcal vaccination recommendations are summarized below and in [Table 2], [Table 3] and [Figure 1]. 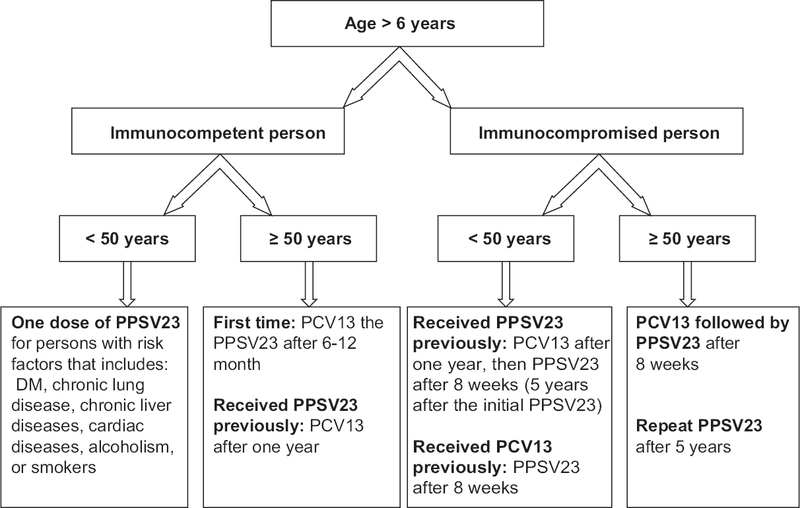 All vaccine-naïve adults age ≥50 years should receive one dose of PCV13 followed by PPSV23 after 1-year or more. Individual who received PPSV23 should receive PCV13 at least 1-year later from the last dose of PPSV23 [Evidence Category A]. All children (including children with high-risk conditions) are strongly recommended to receive 4 doses of PCV13 at the 1st year of life. As per the National Immunization Program, the vaccine should be received at age 2, 4, 6, and 12 months  [Evidence Category A]. 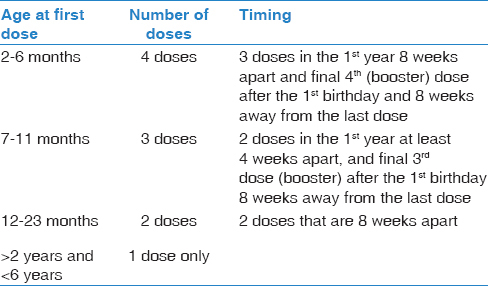 In children <6 years, the incidence of the IPD, the immunological responses, and the safety results from various studies support the use for catch-up schedules utilizing PCV13., 89, ,,,, [Table 2] illustrates the recommended PCV13 catch-up doses in children <6 years [Evidence Category A]. Pneumococcal vaccines have been shown to reduce the risk of IPD and to induce a high immunological response to the vaccine-related serotypes in a high-risk group individual [Table 1], 25, ,,,,, [Evidence Category A]. Children <2 years with high-risk conditions should receive routine and catch-up pneumococcal vaccination similar to healthy children [Evidence Category B]. Concomitant administration of PCV13 and trivalent inactivated influenza vaccine (TIV) has been shown to be immunogenic and safe. A randomized, double-blind study has reported a slightly lower pneumococcal serotype-specific antibody concentrations with PCV13 plus TIV compared with PCV13 alone or TIV alone among adults aged ≥65 years. Currently, there are no data on the safety or efficacy of the coadministration of pneumococcal vaccine with other vaccines (tetanus, diphtheria, pertussis, or zoster vaccine) among adults. During the 2011–2012 Hajj session, a survey of pneumococcal nasal colonization in adults was conducted at the beginning and the end of Hajj. By comparing the end of Hajj to pre-Hajj data, the overall carriage rate increased from 4.4% to 7.5%, the carriage of PPSV23 serotypes from 2.3% to 4.1%, the carriage of PCV13 from 1.1% to 3.6%, antibiotic nonsusceptible isolates from 2.5% to 6.1%, and multiple nonsusceptible isolates from 0.6% to 2.2%. A similar report from France showed 2.7-fold increase in the nasal carriage rate of S. pneumoniae in the pilgrims returning from the 2012 Hajj pilgrimage. Interestingly, only 7% of pilgrims received advice from their general practitioner about pneumococcal vaccination before the Hajj and the uptake of the vaccine among pilgrims was as low as 5%., Another report from Australia found that only 14.2–28.7% of all pilgrims received the pneumococcal vaccine and 29–45.3% of the high-risk group received it. Behavioral interventions are also recommended that includes good hand hygiene technique and cough etiquette, wearing a face mask, and contact avoidance can be effective to avoid acute respiratory illness among Hajj pilgrims. Because of lack of evidence, it is not recommended to provide a pneumococcal vaccine routinely to healthy persons aged <50 years. Pregnancy is not a risk factor for pneumococcal diseases. However, a pregnant woman who has another risk factor for pneumococcal diseases might receive the vaccine during the second or third trimesters as both PCV13 and PPSV23 are probably safe during this period [Evidence Category B]., The safety of these vaccines has not been evaluated during the first trimester of pregnancy. Although no adverse consequences have been reported among newborns whose mothers were inadvertently vaccinated during pregnancy, it is advisable to delay the vaccination until the second trimester if indicated. Reduction of neonatal infections after vaccination has been documented. Sickle cell disease (SCD) is an autosomal recessive disorder, results from the production of abnormal hemoglobin S, and is associated with significant morbidity and mortality. The annual prevalence of SCD was found to be almost constant in Saudi Arabia with an average rate of 4.5%: 4.2% carriers and 0.3% diseased. This survey reported regional variability of SCD, with the highest prevalence (13.4%) in the eastern province. S. pneumoniae is known to be one of the major organisms that cause infection in patients with SCD. This is mainly related to the status of functional asplenia that presents in 80% of cases before the end of the 1st year of age. Asplenic status is a known risk factor for infection with encapsulated organisms (such as S. pneumoniae). Such patients are usually 30–600 fold more susceptible to IPD than healthy person. Pneumococcal vaccines and penicillin prophylaxis have led to a significant decrease in the rate of IPD in those patients. Since the introduction of PCV7, the incidence of IPD among persons with SCD in the USA decreased by 90.8% among children aged <2 years and by 93.4% among children aged <5 years. Another study revealed a drop in the incidence of IPD among African American <18 years with SCD by 53% in 2009 compared to 1988 era. Finally, both PCV7 and PPSV23 have shown an additive effect manifested by significantly higher antibody titer for children with SCD aged >2 years receiving both vaccines compared to children received PPSV23 alone. For individuals with SCD aged ≥6 years: Vaccination as shown in [Figure 1]. 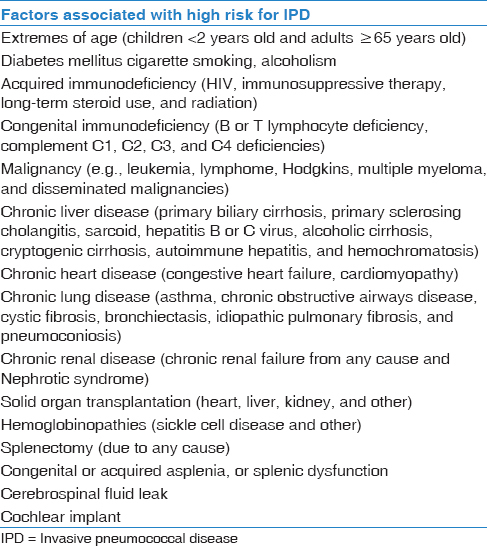 SCIPV recommendations for splenectomized persons are as follows: [Evidence Category B]. For those undergoing elective splenectomy, it is recommended to administer pneumococcal vaccination at least 14 days before splenectomy or 14 days after splenectomy. For individuals who require additional doses of PPSV23, it should be given no sooner than 8 weeks after PCV13 and at least 5 years after the most recent dose of PPSV23. We are grateful for the expert advice from Prof. Alimuddin Zumla and Prof. Peter Wilson, University College London and Dr. Ron Behrens, London School of Hygiene and Tropical Medicine, United Kingdom; and UCL Hospitals NHS Foundation Trust, United Kingdom; Prof. Daniel M. Musher, Baylor College of Medicine, Houston, Texas, USA; and Prof. Antoni Torres, Hospital Clinic de Barcelona, Spain. The Saudi Thoracic Society provided kind support for the Scientific Committee for Influenza and Pneumococcal Vaccinations. 23-valent pneumococcal polysaccharide vaccine. WHO position paper. Wkly Epidemiol Rec 2008;83:373-84. Jain S, Self WH, Wunderink RG, Fakhran S, Balk R, Bramley AM, et al. Community-acquired pneumonia requiring hospitalization among U.S. adults. N Engl J Med 2015;373:415-27. Jain S, Self WH, Wunderink RG; CDC EPIC Study Team. Community-acquired pneumonia requiring hospitalization. N Engl J Med 2015;373:2382. Jain S, Williams DJ, Arnold SR, Ampofo K, Bramley AM, Reed C, et al. Community-acquired pneumonia requiring hospitalization among U.S. children. N Engl J Med 2015;372:835-45. Annoynymous. World Population Prospects: The 2012 Revision; 2012. Available from: . [Last accessed on 2012 Jul 21]. Feldman C, Abdulkarim E, Alattar F, Al Lawati F, Al Khatib H, Al Maslamani M, et al. Pneumococcal disease in the Arabian Gulf: Recognizing the challenge and moving toward a solution. J Infect Public Health 2013;6:401-9. Mokdad A. Saudi Health Interview Survey Finds High Rates of Chronic Diseases in the Kingdom of Saudi Arabia; 2013. Available from: http://www.healthdata.org/news-release/saudi-health-interview-survey-finds-high-rates-chronic-diseases- kingdom-saudi-arabia. [Last accessed on 2015 Jul 15]. Nuorti JP, Whitney CG; Centers for Disease Control and Prevention (CDC). Prevention of pneumococcal disease among infants and children – Use of 13-valent pneumococcal conjugate vaccine and 23-valent pneumococcal polysaccharide vaccine – Recommendations of the Advisory Committee on Immunization Practices (ACIP). MMWR Recomm Rep 2010;59:1-18. Tinoco JC, Juergens C, Ruiz Palacios GM, Vazquez-Narvaez J, Enkerlin-Pauwells HL, Sundaraiyer V, et al. Open-label trial of immunogenicity and safety of a 13-valent pneumococcal conjugate vaccine in adults≥50 years of age in Mexico. Clin Vaccine Immunol 2015;22:185-92. Yezli S, Shibl AM, Livermore DM, Memish ZA. Antimicrobial resistance among Gram-positive pathogens in Saudi Arabia. J Chemother 2012;24:125-36. Fouda SI, Kadry AA, Shibl AM. Beta-lactam and macrolide resistance and serotype distribution among Streptococcus pneumoniae isolates from Saudi Arabia. J Chemother 2004;16:517-23. Memish ZA, Balkhy HH, Shibl AM, Barrozo CP, Gray GC. Streptococcus pneumoniae in Saudi Arabia: Antibiotic resistance and serotypes of recent clinical isolates. Int J Antimicrob Agents 2004;23:32-8. Memish ZA, Osoba AO, Shibl AM, Mokaddas E, Venkatesh S, Rotimi VO. Emergence and trends of penicillin non-susceptible Streptococcus pneumoniae in Saudi Arabia and Kuwait – Perspective and outstanding issues. J Chemother 2007;19:471-81. Shibl AM, Al Rasheed AM, Elbashier AM, Osoba AO. Penicillin-resistant and -intermediate Streptococcus pneumoniae in Saudi Arabia. J Chemother 2000;12:134-7. Twum-Danso K, Al-Mazrou AM, Kambal AM, Al-Zamil FA. Penicillin resistance in serogroups/serotypes of Streptococcus pneumoniae causing invasive infections in Central Saudi Arabia. Saudi Med J 2003;24:1210-3. Khan JH, Lababidi HM, Al-Moamary MS, Zeitouni MO, Al-Jahdali HH, Al-Amoudi OS, et al. The Saudi guidelines for the diagnosis and management of COPD. Ann Thorac Med 2014;9:55-76. Al-Moamary MS, Alhaider SA, Al-Hajjaj MS, Al-Ghobain MO, Idrees MM, Zeitouni MO, et al. The Saudi initiative for asthma-2012 update: Guidelines for the diagnosis and management of asthma in adults and children. Ann Thorac Med 2012;7:175-204. Al-Moamary MS, Alhaider SA, Idrees MM, Al-Ghobain MO, Zeitouni MO, Al-Harbi AS, et al. The Saudi initiative for asthma-2016 update: Guidelines for the diagnosis and management of asthma in adults and children. Ann Thorac Med 2016;11:3. Zeitouni MO, Al Barrak AM, Al-Moamary MS, Alharbi NS, Idrees MM, Al Shimemeri AA, et al. The Saudi thoracic society guidelines for influenza vaccinations. Ann Thorac Med 2015;10:223-30. Kobayashi M, Bennett NM, Gierke R, Almendares O, Moore MR, Whitney CG, et al. Intervals between PCV13 and PPSV23 vaccines: Recommendations of the Advisory Committee on Immunization Practices (ACIP). MMWR Morb Mortal Wkly Rep 2015;64:944-7. Tomczyk S, Bennett NM, Stoecker C, Gierke R, Moore MR, Whitney CG, et al. Use of 13-valent pneumococcal conjugate vaccine and 23-valent pneumococcal polysaccharide vaccine among adults aged ≥65 years: Recommendations of the Advisory Committee on Immunization Practices (ACIP). MMWR Morb Mortal Wkly Rep 2014;63:822-5. Centers for Disease Control and Prevention (CDC). Use of 13-valent pneumococcal conjugate vaccine and 23-valent pneumococcal polysaccharide vaccine among children aged 6-18 years with immunocompromising conditions: Recommendations of the Advisory Committee on Immunization Practices (ACIP). MMWR Morb Mortal Wkly Rep 2013;62:521-4. Centers for Disease Control and Prevention (CDC). Use of 13-valent pneumococcal conjugate vaccine and 23-valent pneumococcal polysaccharide vaccine for adults with immunocompromising conditions: Recommendations of the Advisory Committee on Immunization Practices (ACIP). MMWR Morb Mortal Wkly Rep 2012;61:816-9. Centers for Disease Control and Prevention (CDC); Advisory Committee on Immunization Practices. 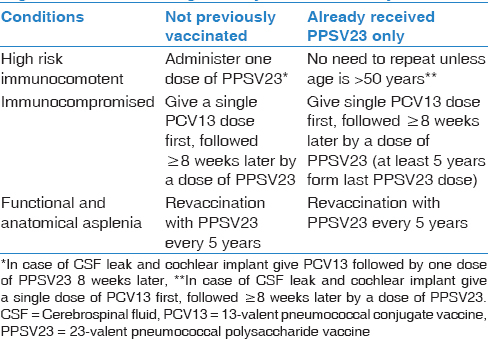 Updated recommendations for prevention of invasive pneumococcal disease among adults using the 23-valent pneumococcal polysaccharide vaccine (PPSV23). MMWR Morb Mortal Wkly Rep 2010;59:1102-6. Simberkoff MS, Cross AP, Al-Ibrahim M, Baltch AL, Geiseler PJ, Nadler J, et al. Efficacy of pneumococcal vaccine in high-risk patients. Results of a Veterans Administration Cooperative Study. N Engl J Med 1986;315:1318-27. Davies JM, Lewis MP, Wimperis J, Rafi I, Ladhani S, Bolton-Maggs PH; British Committee for Standards in Haematology. Review of guidelines for the prevention and treatment of infection in patients with an absent or dysfunctional spleen: Prepared on behalf of the British Committee for Standards in Haematology by a working party of the Haemato-Oncology task force. Br J Haematol 2011;155:308-17. Thigpen MC, Whitney CG, Messonnier NE, Zell ER, Lynfield R, Hadler JL, et al. Bacterial meningitis in the United States, 1998-2007. N Engl J Med 2011;364:2016-25. Musher DM. How effective is vaccination in preventing pneumococcal disease? Infect Dis Clin North Am 2013;27:229-41. Musher DM, Thorner AR. Community-acquired pneumonia. N Engl J Med 2014;371:1619-28.
el-Mouzan MI, Twan-Danso K, Al-Awamy BH, Niazi GA, Altorki MT. Pneumococcal infections in eastern Saudi Arabia: Serotypes and antibiotic sensitivity patterns. Trop Geogr Med 1988;40:213-7. Mallouh AA, Salamah MM. Pattern of bacterial infections in homozygous sickle cell disease. A report from Saudi Arabia. Am J Dis Child 1985;139:820-2. Memish ZA, El-Saed A, Al-Otaibi B, Shaalan MA, Alola SA, Thaqafi AO. Epidemiology of invasive pneumococcal infection in children aged five years and under in Saudi Arabia: A five-year retrospective surveillance study. Int J Infect Dis 2010;14:e708-12. Asghar AH. Frequency and antibiotic susceptibility of gram-positive bacteria in Makkah hospitals. Ann Saudi Med 2011;31:462-8. Shibl AM. Distribution of serotypes and antibiotic resistance of invasive pneumococcal disease isolates among children aged 5 years and under in Saudi Arabia (2000-2004). Clin Microbiol Infect 2008;14:876-9. Amyes SG. Enterococci and streptococci. Int J Antimicrob Agents 2007;29 Suppl 3:S43-52. Brigante GR, Luzzaro FA, Pini B, Lombardi G, Sokeng G, Toniolo AQ. Drug susceptibility testing of clinical isolates of streptococci and enterococci by the Phoenix automated microbiology system. BMC Microbiol 2007;7:46. Lynch JP 3rd, Zhanel GG. Streptococcus pneumoniae: Epidemiology and risk factors, evolution of antimicrobial resistance, and impact of vaccines. Curr Opin Pulm Med 2010;16:217-25. Reinert RR. The antimicrobial resistance profile of Streptococcus pneumoniae. Clin Microbiol Infect 2009;15 Suppl 3:7-11. Marimón JM, Alonso M, Rolo D, Ardanuy C, Liñares J, Pérez-Trallero E. Molecular characterization of Streptococcus pneumoniae invasive serotype 19A isolates from adults in two Spanish regions (1994-2009). Eur J Clin Microbiol Infect Dis 2012;31:1009-13. Marimon JM, Ercibengoa M, Alonso M, García-Medina G, Pérez-Trallero E. Prevalence and molecular characterization of Streptococcus pneumoniae serotype 6C causing invasive disease in Gipuzkoa, northern Spain, 1990-2009. Eur J Clin Microbiol Infect Dis 2010;29:1035-8. Jenkins SG, Brown SD, Farrell DJ. Trends in antibacterial resistance among Streptococcus pneumoniae isolated in the USA: Update from PROTEKT US Years 1-4. Ann Clin Microbiol Antimicrob 2008;7:1. Kambal AM, Abdullah AM. Childhood pneumococcal bacteraemia in Riyadh, Saudi Arabia. Ann Trop Paediatr 1997;17:245-51. Shibl AM, Memish ZA, Al-Kattan KM. Antibiotic resistance and serotype distribution of invasive pneumococcal diseases before and after introduction of pneumococcal conjugate vaccine in the Kingdom of Saudi Arabia (KSA). Vaccine 2012;30 Suppl 6:G32-6. Henningham A, Barnett TC, Maamary PG, Walker MJ. Pathogenesis of group A streptococcal infections. Discov Med 2012;13:329-42. Mitchell TJ. The pathogenesis of streptococcal infections: From tooth decay to meningitis. Nat Rev Microbiol 2003;1:219-30.
WHO Publication. Pneumococcal vaccines WHO position paper-2012 – Recommendations. Vaccine 2012;30:4717-8. Bridy-Pappas AE, Margolis MB, Center KJ, Isaacman DJ. Streptococcus pneumoniae: Description of the pathogen, disease epidemiology, treatment, and prevention. Pharmacotherapy 2005;25:1193-212. Musher DM. Streptococcus pneumoniae. In: Mandell GL, Bennett JE, Dolin R, editors. Principles and Practice of Infectious Diseases. 7th ed. Philadelphia, PA, USA: Churchill Livingstone; 2010. p. 2623. From the centers for disease control and prevention. Updated recommendations on the use of pneumococcal conjugate vaccine in a setting of vaccine shortage – Advisory Committee on Immunization Practices. JAMA 2002;287:833-4. Shibl A, Senok A, Memish Z. Infectious diseases in the Arabian Peninsula and Egypt. Clin Microbiol Infect 2012;18:1068-80. Hill PC, Townend J, Antonio M, Akisanya B, Ebruke C, Lahai G, et al. Transmission of Streptococcus pneumoniae in rural Gambian villages: A longitudinal study. Clin Infect Dis 2010;50:1468-76. Yagupsky P, Porat N, Fraser D, Prajgrod F, Merires M, McGee L, et al. Acquisition, carriage, and transmission of pneumococci with decreased antibiotic susceptibility in young children attending a day care facility in Southern Israel. J Infect Dis 1998;177:1003-12. Al-Mazrou A, Twum-Danso K, Al Zamil F, Kambal A. Streptococcus pneumoniae serotypes/serogroups causing invasive disease in Riyadh, Saudi Arabia: Extent of coverage by pneumococcal vaccines. Ann Saudi Med 2005;25:94-9. Prato R, Fortunato F, Martinelli D. Pneumococcal pneumonia prevention among adults: Is the herd effect of pneumococcal conjugate vaccination in children as good a way as the active immunization of the elderly? Curr Med Res Opin 2015:1-3. [Epub ahead of print]. [Available from: http://www.ncbi.nlm.nih.gov/pubmed/26652736]. Schiffner-Rohe J, Witt A, Hemmerling J, von Eiff C, Leverkus FW. Efficacy of PPV23 in preventing pneumococcal pneumonia in adults at increased Risk – A systematic review and meta-analysis. PLoS One 2016;11:e0146338. Butler JC, Breiman RF, Campbell JF, Lipman HB, Broome CV, Facklam RR. Pneumococcal polysaccharide vaccine efficacy. An evaluation of current recommendations. JAMA 1993;270:1826-31. Sims RV, Steinmann WC, McConville JH, King LR, Zwick WC, Schwartz JS. The clinical effectiveness of pneumococcal vaccine in the elderly. Ann Intern Med 1988;108:653-7. Ammann AJ, Addiego J, Wara DW, Lubin B, Smith WB, Mentzer WC. Polyvalent pneumococcal-polysaccharide immunization of patients with sickle-cell anemia and patients with splenectomy. N Engl J Med 1977;297:897-900. Moberley S, Holden J, Tatham DP, Andrews RM. Vaccines for preventing pneumococcal infection in adults. Cochrane Database Syst Rev 2013;1:CD000422. Fedson DS. The clinical effectiveness of pneumococcal vaccination: A brief review. Vaccine 1999;17 Suppl 1:S85-90. Vila-Corcoles A, Salsench E, Rodriguez-Blanco T, Ochoa-Gondar O, de Diego C, Valdivieso A, et al. Clinical effectiveness of 23-valent pneumococcal polysaccharide vaccine against pneumonia in middle-aged and older adults: A matched case-control study. Vaccine 2009;27:1504-10. Jackson LA, Neuzil KM, Yu O, Benson P, Barlow WE, Adams AL, et al. Effectiveness of pneumococcal polysaccharide vaccine in older adults. N Engl J Med 2003;348:1747-55. Annoynymous. PNEUMOVAX 23 Safely and Effectively; 2014. Available from: . [Last accessed on 2015 Jul 21]. Nicholls TR, Leach AJ, Morris PS. The short-term impact of each primary dose of pneumococcal conjugate vaccine on nasopharyngeal carriage: Systematic review and meta-analyses of randomised controlled trials. Vaccine 2016;34:703-13. Herrero FS, Cardona CG, Palop NT, Fabrellas EF, Briones ML, Juan ÁC, et al. The potential role of 13-valent pneumococcal conjugate vaccine in preventing respiratory complications in bacteraemic pneumococcal community-acquired pneumonia. Vaccine 2016. pii: S0264-410X00082-7. Sun W. 30 December, 2011 Approval Letter – Prevnar 13; 2011. Available from: . [Last cited on 2016 Jan 06]. Al-Sheikh YA, K Gowda L, Mohammed Ali MM, John J, Khaled Homoud Mohammed D, Chikkabidare Shashidhar P. Distribution of serotypes and antibiotic susceptibility patterns among invasive pneumococcal diseases in Saudi Arabia. Ann Lab Med 2014;34:210-5. Krishnappa LG, Marie MA, John J, Dabwan KH, Shashidhar PC. Serological and molecular capsular typing, antibiotic susceptibility of Streptococcus pneumoniae isolates from invasive and non-invasive infections. Acta Microbiol Immunol Hung 2014;61:173-9. Bonten MJ, Huijts SM, Bolkenbaas M, Webber C, Patterson S, Gault S, et al. Polysaccharide conjugate vaccine against pneumococcal pneumonia in adults. N Engl J Med 2015;372:1114-25. Jódar L, Butler J, Carlone G, Dagan R, Goldblatt D, Käyhty H, et al. Serological criteria for evaluation and licensure of new pneumococcal conjugate vaccine formulations for use in infants. Vaccine 2003;21:3265-72. Moore CE, Paul J, Foster D, Mahar SA, Griffiths D, Knox K, et al. Reduction of invasive pneumococcal disease 3 years after the introduction of the 13-valent conjugate vaccine in the Oxfordshire region of England. J Infect Dis 2014;210:1001-11. Moore MR, Link-Gelles R, Schaffner W, Lynfield R, Lexau C, Bennett NM, et al. Effect of use of 13-valent pneumococcal conjugate vaccine in children on invasive pneumococcal disease in children and adults in the USA: Analysis of multisite, population-based surveillance. Lancet Infect Dis 2015;15:301-9. Esposito S, Lizioli A, Lastrico A, Begliatti E, Rognoni A, Tagliabue C, et al. Impact on respiratory tract infections of heptavalent pneumococcal conjugate vaccine administered at 3, 5 and 11 months of age. Respir Res 2007;8:12. Cutts FT, Zaman SM, Enwere G, Jaffar S, Levine OS, Okoko JB, et al. Efficacy of nine-valent pneumococcal conjugate vaccine against pneumonia and invasive pneumococcal disease in the Gambia: Randomised, double-blind, placebo-controlled trial. Lancet 2005;365:1139-46. Klugman KP, Madhi SA, Huebner RE, Kohberger R, Mbelle N, Pierce N; Vaccine Trialists Group. A trial of a 9-valent pneumococcal conjugate vaccine in children with and those without HIV infection. N Engl J Med 2003;349:1341-8. Grijalva C, Wunderink R, Williams D, Zhu Y, Balk R, Fakhran S, et al., editors. Distribution of pneumococccal serotypes detected through urine analysis among US adults hospitalized with pneumonia after introduction of PCV13. Proceedings of the International Symposium on Pneumococci and Pneumococcal Diseases. Glasgow, Scotland: ISPPD; 2014. Isturiz RE, Schmoele-Thoma B, Scott DA, Jodar L, Webber C, Sings HL, et al. Pneumococcal conjugate vaccine use in adults. Expert Rev Vaccines 2016. [doi: 10.1586/14760584.2016.1132171]. Centers for Disease Control and Prevention (CDC). Licensure of a 13-valent pneumococcal conjugate vaccine (PCV13) and recommendations for use among children – Advisory Committee on Immunization Practices (ACIP), 2010. MMWR Morb Mortal Wkly Rep 2010;59:258-61. Annoynymous. PREVNAR 13 Safely and Effectively; 2010. Available from: http://www.fda.gov/downloads/BiologicsBloodVaccines/Vaccines/ApprovedProducts/UCM201669.pdf. [Last accessed on 2015 Jul 21]. Jackson LA, Gurtman A, van Cleeff M, Frenck RW, Treanor J, Jansen KU, et al. Influence of initial vaccination with 13-valent pneumococcal conjugate vaccine or 23-valent pneumococcal polysaccharide vaccine on anti-pneumococcal responses following subsequent pneumococcal vaccination in adults 50 years and older. Vaccine 2013;31:3594-602. Centers for Disease Control and Prevention (CDC). Licensure of 13-valent pneumococcal conjugate vaccine for adults aged 50 years and older. MMWR Morb Mortal Wkly Rep 2012;61:394-5. Esposito S, Mari D, Bergamaschini L, Orenti A, Terranova L, Ruggiero L, et al. Pneumococcal colonization in older adults. Immun Ageing 2016;13:2. Lucero MG, Nohynek H, Williams G, Tallo V, Simões EA, Lupisan S, et al. Efficacy of an 11-valent pneumococcal conjugate vaccine against radiologically confirmed pneumonia among children less than 2 years of age in the Philippines: A randomized, double-blind, placebo-controlled trial. Pediatr Infect Dis J 2009;28:455-62. Whitney CG, Pilishvili T, Farley MM, Schaffner W, Craig AS, Lynfield R, et al. Effectiveness of seven-valent pneumococcal conjugate vaccine against invasive pneumococcal disease: A matched case-control study. Lancet 2006;368:1495-502. Black S, Shinefield H, Fireman B, Lewis E, Ray P, Hansen JR, et al. Efficacy, safety and immunogenicity of heptavalent pneumococcal conjugate vaccine in children. Northern California Kaiser Permanente Vaccine Study Center Group. Pediatr Infect Dis J 2000;19:187-95. Yildirim I, Shea KM, Pelton SI. Pneumococcal disease in the era of pneumococcal conjugate vaccine. Infect Dis Clin North Am 2015;29:679-97. Togashi T, Okada K, Yamaji M, Thompson A, Gurtman A, Cutler M, et al. Immunogenicity and safety of a 13-valent pneumococcal conjugate vaccine given with DTaP vaccine in healthy infants in Japan. Pediatr Infect Dis J 2015;34:1096-104. Wysocki J, Brzostek J, Szymanski H, Tetiurka B, Toporowska-Kowalska E, Wasowska-Królikowska K, et al. Immunogenicity and safety of a 13-valent pneumococcal conjugate vaccine administered to older infants and children naïve to pneumococcal vaccination. Vaccine 2015;33:1719-25. De Wals P, Lefebvre B, Markowski F, Deceuninck G, Defay F, Douville-Fradet M, et al. Impact of 2+1 pneumococcal conjugate vaccine program in the province of Quebec, Canada. Vaccine 2014;32:1501-6. Picón T, Alonso L, García Gabarrot G, Speranza N, Casas M, Arrieta F, et al. Effectiveness of the 7-valent pneumococcal conjugate vaccine against vaccine-type invasive disease among children in Uruguay: An evaluation using existing data. Vaccine 2013;31 Suppl 3:C109-13. O'Brien KL, Millar EV, Zell ER, Bronsdon M, Weatherholtz R, Reid R, et al. Effect of pneumococcal conjugate vaccine on nasopharyngeal colonization among immunized and unimmunized children in a community-randomized trial. J Infect Dis 2007;196:1211-20. Aamodt AH, Stovner LJ, Langhammer A, Hagen K, Zwart JA. Is headache related to asthma, hay fever, and chronic bronchitis? The Head-HUNT Study. Headache 2007;47:204-12. Bhorat AE, Madhi SA, Laudat F, Sundaraiyer V, Gurtman A, Jansen KU, et al. Immunogenicity and safety of the 13-valent pneumococcal conjugate vaccine in HIV-infected individuals naive to pneumococcal vaccination. AIDS 2015;29:1345-54. Madhi SA, Kuwanda L, Cutland C, Holm A, Käyhty H, Klugman KP. Quantitative and qualitative antibody response to pneumococcal conjugate vaccine among African human immunodeficiency virus-infected and uninfected children. Pediatr Infect Dis J 2005;24:410-6. Ren S, Newby D, Li SC, Walkom E, Miller P, Hure A, et al. Effect of the adult pneumococcal polysaccharide vaccine on cardiovascular disease: A systematic review and meta-analysis. Open Heart 2015;2:e000247. Migita K, Akeda Y, Akazawa M, Tohma S, Hirano F, Ideguchi H, et al. Effect of abatacept on the immunogenicity of 23-valent pneumococcal polysaccharide vaccination (PPSV23) in rheumatoid arthritis patients. Arthritis Res Ther 2015;17:357. Lindström V, Aittoniemi J, Lyytikäinen O, Klemets P, Ollgren J, Silvennoinen R, et al. Invasive pneumococcal disease in patients with haematological malignancies before routine use of conjugate vaccines in Finland. Infect Dis (Lond) 2015:1-4. [Epub ahead of print]. Schwarz TF, Flamaing J, Rümke HC, Penzes J, Juergens C, Wenz A, et al. A randomized, double-blind trial to evaluate immunogenicity and safety of 13-valent pneumococcal conjugate vaccine given concomitantly with trivalent influenza vaccine in adults aged ≥65 years. Vaccine 2011;29:5195-202. Rashid H, Abdul Muttalif AR, Mohamed Dahlan ZB, Djauzi S, Iqbal Z, Karim HM, et al. The potential for pneumococcal vaccination in Hajj pilgrims: Expert opinion. Travel Med Infect Dis 2013;11:288-94. Memish ZA, Assiri A, Turkestani A, Yezli S, Al Masri M, Charrel R, et al. Mass gathering and globalization of respiratory pathogens during the 2013 Hajj. Clin Microbiol Infect 2015;21:571.e1-8. Benkouiten S, Gautret P, Belhouchat K, Drali T, Salez N, Memish ZA, et al. Acquisition of Streptococcus pneumoniae carriage in pilgrims during the 2012 Hajj. Clin Infect Dis 2014;58:e106-9. Memish ZA, Assiri A, Almasri M, Alhakeem RF, Turkestani A, Al Rabeeah AA, et al. Impact of the Hajj on pneumococcal transmission. Clin Microbiol Infect 2015;21:77.e11-8. Sridhar S, Belhouchat K, Drali T, Benkouiten S, Parola P, Brouqui P, et al. French Hajj pilgrims' experience with pneumococcal infection and vaccination: A knowledge, attitudes and practice (KAP) evaluation. Travel Med Infect Dis 2015;13:251-5. Al-Tawfiq JA, Memish ZA. Prevention of pneumococcal infections during mass gathering. Hum Vaccin Immunother 2015:1-5. [Epub ahead of print] [doi: 10.1080/21645515.2015.1058456]. Tashani M, Alfelali M, Barasheed O, Fatema FN, Alqahtani A, Rashid H, et al. Australian Hajj pilgrims' knowledge about MERS-CoV and other respiratory infections. Virol Sin 2014;29:318-20. Ridda I, King C, Rashid H. Pneumococcal infections at Hajj: Current knowledge gaps. Infect Disord Drug Targets 2014;14:177-84. Quiambao BP, Nohynek HM, Käyhty H, Ollgren JP, Gozum LS, Gepanayao CP, et al. Immunogenicity and reactogenicity of 23-valent pneumococcal polysaccharide vaccine among pregnant Filipino women and placental transfer of antibodies. Vaccine 2007;25:4470-7. Nuorti P, Butler J. Prevention of pneumococcal disease: Recommendations of the advisory committee on immunization. MMWR Morb Mortal Wkly Rep 1997;46:1-24. Chaithongwongwatthana S, Yamasmit W, Limpongsanurak S, Lumbiganon P, Tolosa JE. Pneumococcal vaccination during pregnancy for preventing infant infection. Cochrane Database Syst Rev 2015;1:CD004903. Memish ZA, Saeedi MY. Six-year outcome of the national premarital screening and genetic counseling program for sickle cell disease and ß-thalassemia in Saudi Arabia. Ann Saudi Med 2011;31:229-35. Memish ZA, Owaidah TM, Saeedi MY. Marked regional variations in the prevalence of sickle cell disease and ß-thalassemia in Saudi Arabia: Findings from the premarital screening and genetic counseling program. J Epidemiol Glob Health 2011;1:61-8. Meier ER, Miller JL. Sickle cell disease in children. Drugs 2012;72:895-906. Halasa NB, Shankar SM, Talbot TR, Arbogast PG, Mitchel EF, Wang WC, et al. Incidence of invasive pneumococcal disease among individuals with sickle cell disease before and after the introduction of the pneumococcal conjugate vaccine. Clin Infect Dis 2007;44:1428-33. Payne AB, Link-Gelles R, Azonobi I, Hooper WC, Beall BW, Jorgensen JH, et al. Invasive pneumococcal disease among children with and without sickle cell disease in the United States, 1998 to 2009. Pediatr Infect Dis J 2013;32:1308-12. Vernacchio L, Neufeld EJ, MacDonald K, Kurth S, Murakami S, Hohne C, et al. Combined schedule of 7-valent pneumococcal conjugate vaccine followed by 23-valent pneumococcal vaccine in children and young adults with sickle cell disease. J Pediatr 1998;133:275-8. Jump RL, Banks R, Wilson B, Montpetite MM, Carter R, Phillips S, et al. A Virtual clinic improves pneumococcal vaccination for asplenic veterans at high risk for pneumococcal disease. InOpen Forum Infectious Diseases. Vol. 2, Oxford: Oxford University Press; 2015. p. ofv165..
Meshikhes AW, Mubarek MA, Abu-Alrahi AI, Al-Saif OH. The pattern of indications and complications of splenectomy in Eastern Saudi Arabia. Saudi Med J 2004;25:1892-5. Al-Qahtani MS. The pattern and management outcomes of splenic injuries in the Assir region of Saudi Arabia. West Afr J Med 2004;23:1-6. Shatz DV, Schinsky MF, Pais LB, Romero-Steiner S, Kirton OC, Carlone GM. Immune responses of splenectomized trauma patients to the 23-valent pneumococcal polysaccharide vaccine at 1 versus 7 versus 14 days after splenectomy. J Trauma 1998;44:760-5. Al-Salem AH. Splenic complications of sickle cell anemia and the role of splenectomy. ISRN Hematol 2011;2011:864257.